The best ideas are sometimes the simplest. The tough new Fenwicks Chain Cleaning Sponge was conceived as a way of applying even pressure to all sides of a chain, for rapid cleaning with minimal mess. Best used on a chain prepared with Fenwick's Foaming Chain Cleaner, the sponge also washes clean very easily with FS-1/FS-10 when you're finished. It may not look much but if cleaned after every use, it will clean up chains time and time again. 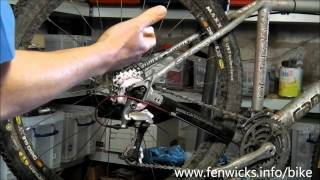 Apply Fenwick’s FOAMING CHAIN CLEANER and allow to soak in, Insert chain into ‘V’ slot of sponge on the lower section of the chain, Holding sponge firmly in position, run the chain backwards through the sponge for 30 seconds, Rinse the chain thoroughly with clean water, Re-lube with any Fenwick’s chain lube, To clean the sponge, just apply some FENWICK’S FOAMING CHAIN CLEANER to the ‘V’ slot straight after use, rub it in and rinse thoroughly.